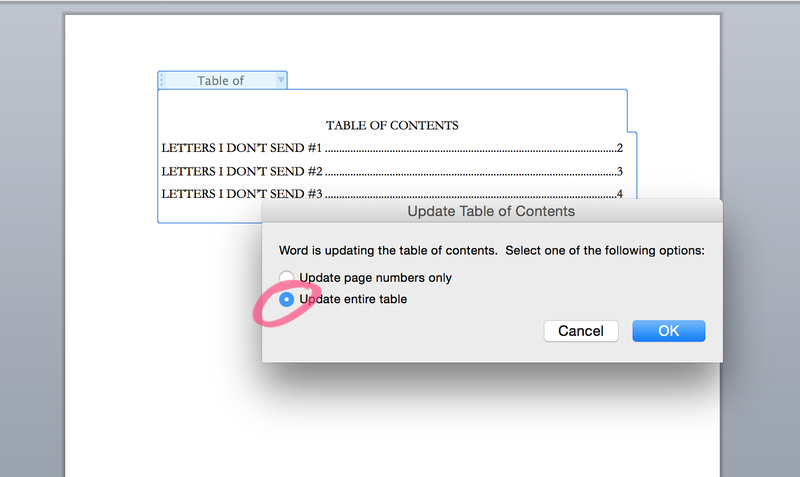 If you’re struggling with formatting a contents page for your manuscript and keeping it up to date, here’s my current method for creating an Automatic Table of Contents in Word. 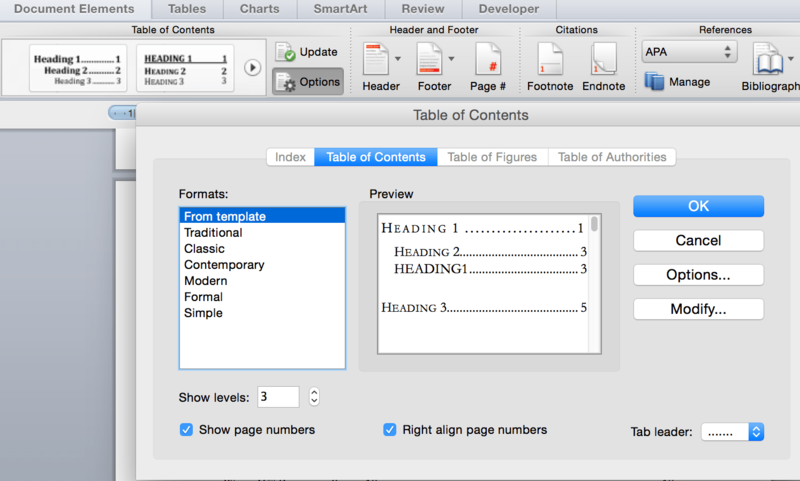 There are also tips for moving individual pieces around and keeping the contents page up to date with a few steps, and, bonus, the document will be easily navigable as an outline through the preview pane. It’s useful for long documents, things with chapters or individual pieces or poems, and I find it very helpful for referring to pieces swiftly in manuscript review or workshop discussion. If you have your own tips or method to share, please leave a comment below! Poems! Or chapters. Or pieces. Anything for which you need headings in a multi-part document or thesis. 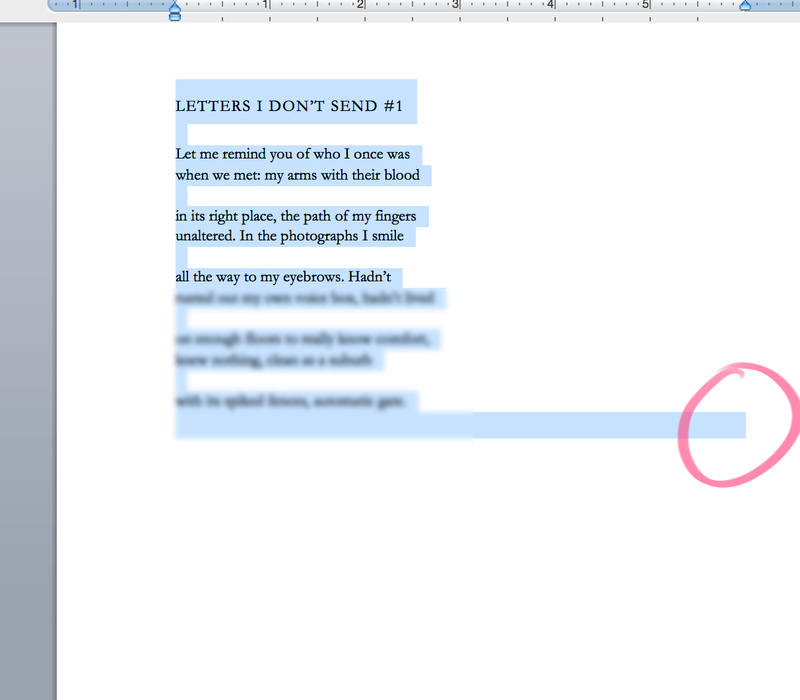 What you’re trying to do is turn the titles of the pieces (/etc) into the “Heading” style, seen here on the main tab. There’s a number of qualities pre-loaded into this Style, including a certain amount of indent or changes to the font or size based on which level of heading you’ve selected (level 1, 2, 3). 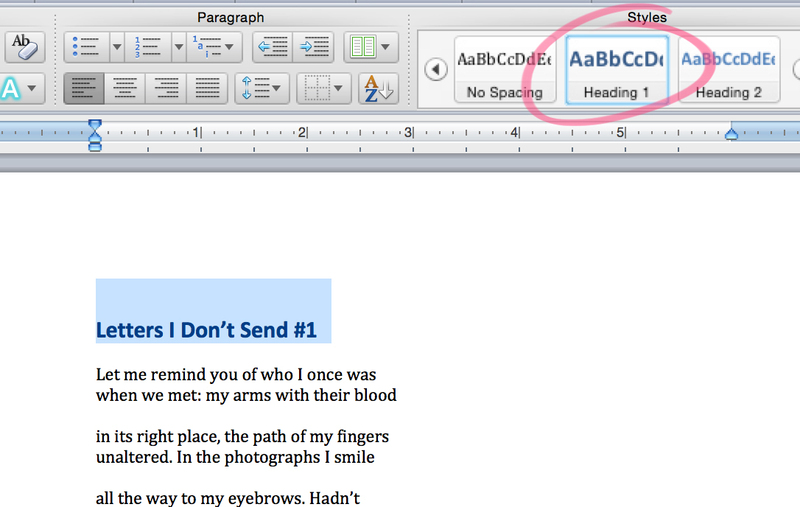 So if you have multiple sections you might use the heading 1 style for the section titles and the heading 2 style for the poems, and they’ll display in a hierarchy in the Table of Contents. Cool. So select your titles, and convert them to the “Heading 1” (or 2, etc) style, based on your needs. Yay, cute. 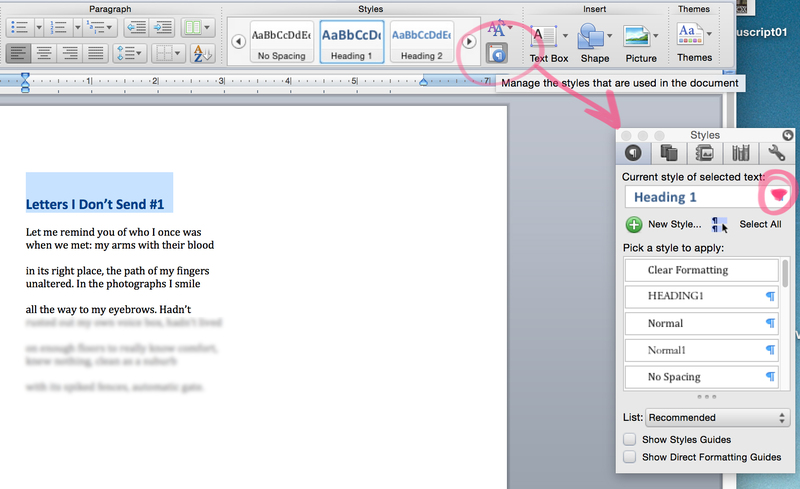 Next to the Styles section is this button that pops out the Styles as its own window pane. 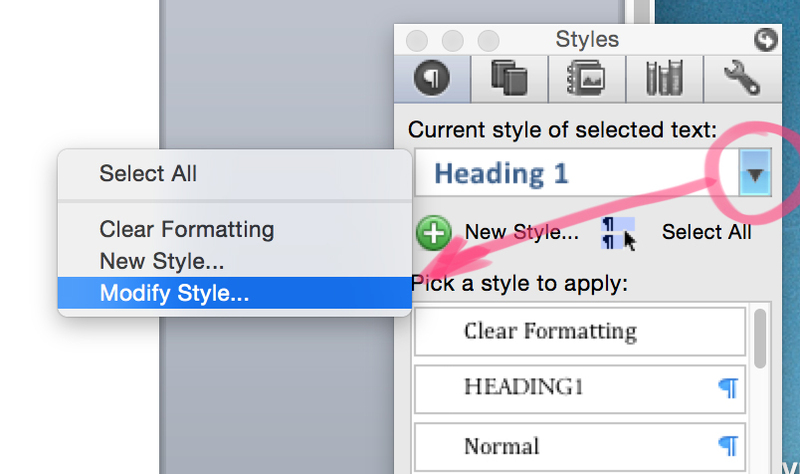 Once you have your styles applied throughout the document, you can change how they appear using this section. All the corresponding styles you’ve set will get updated. Here’s the dropdown menu beside any of the styles. 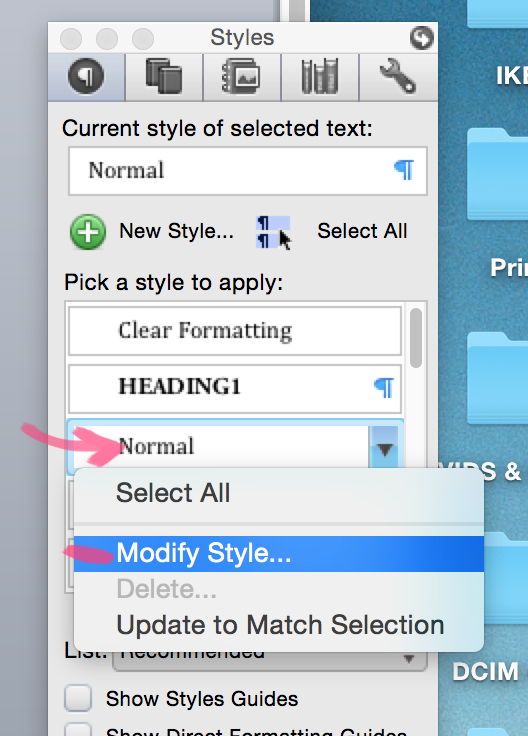 Click on “Modify Style” to change the appearance of your headers or other document elements (or highlight already-formatted text and “update style to match selection”). Some of the things I like to update are in the advanced options at the bottom of this Modify screen — like font, for things like all-caps or small-caps, and any of the other things you can’t change from the main screen (check out the spacing options next to the paragraph justification buttons). I like to do all-caps in the titles and small-caps in the Table of Contents, so that it’s evident which words are capitalized in the title at some point, but when reading it isn’t necessarily drawing focus in that same regard. When you define your style, do it based on your own aesthetic considerations (however mystical). If you’ve gone through and set all of your remaining text to be a particular style (or if it’s automatically set on “Normal”), you can open up that style to add line spacing and other visual preferences (for poetry I tend to prefer lines that are spaced just a bit further apart than prose). 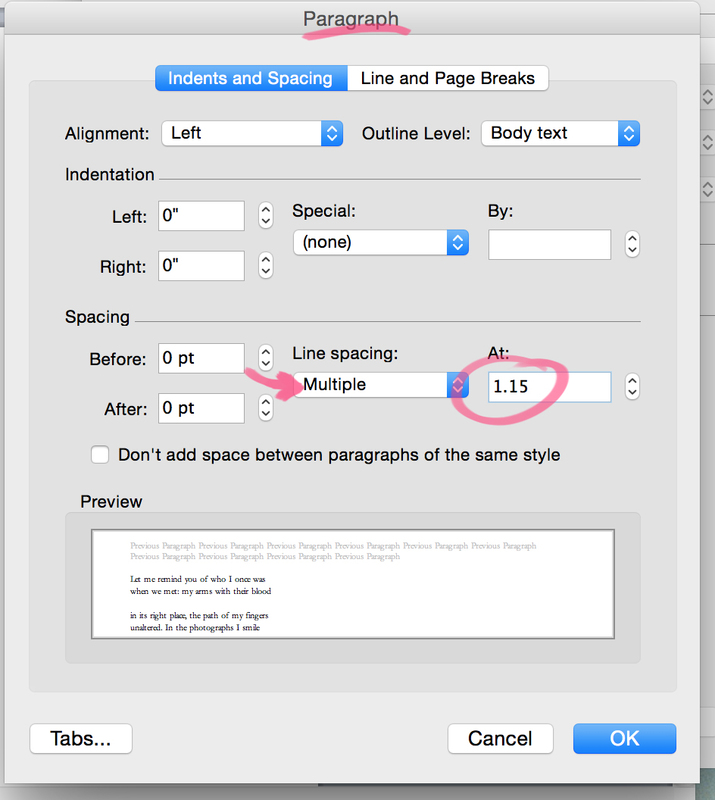 And for spacing your lines further you’ll open up the “Paragraph” section of those advanced options. For lines that are monostichs I might even dial this up to a 1.33. 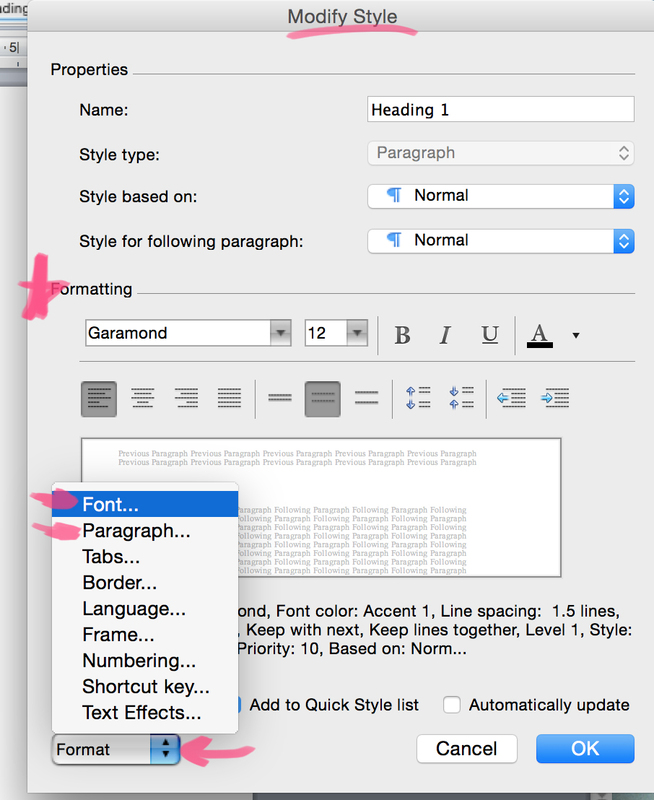 With the styles and the various options screens (paragraph, font, character condensing and expanding), you can do some pretty interesting things visually in Word. 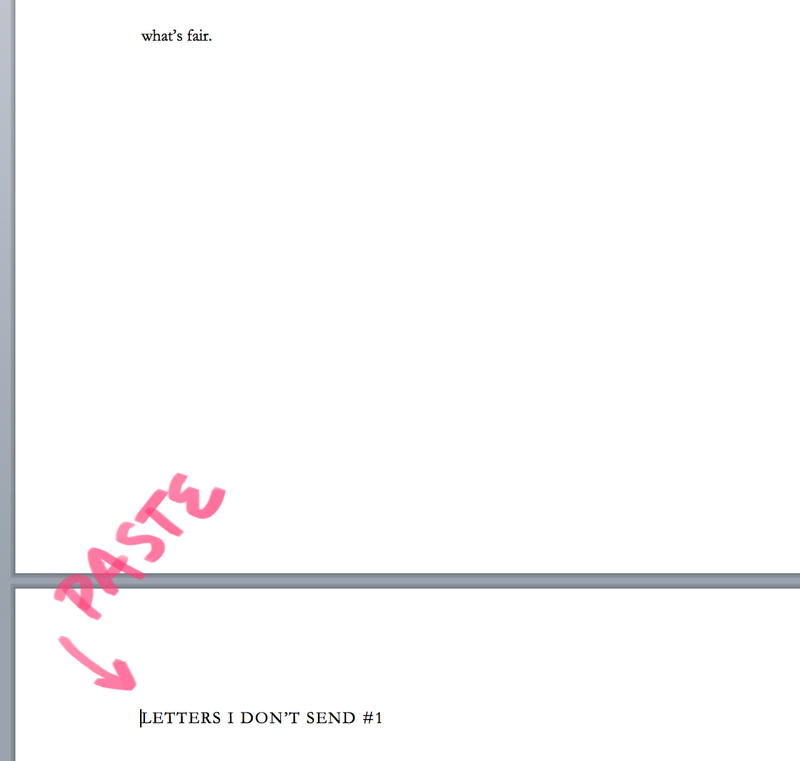 You still have to learn exactly how to cut and paste (where to do it) in order to move things around with the page breaks. Begin by highlighting from the start of the title/header text, down through the body material, but keep going until you see one line of blue appear that juts out beyond your text. That’s the page break return. Ease back until that’s the last thing selected and cut and paste so that you include it. 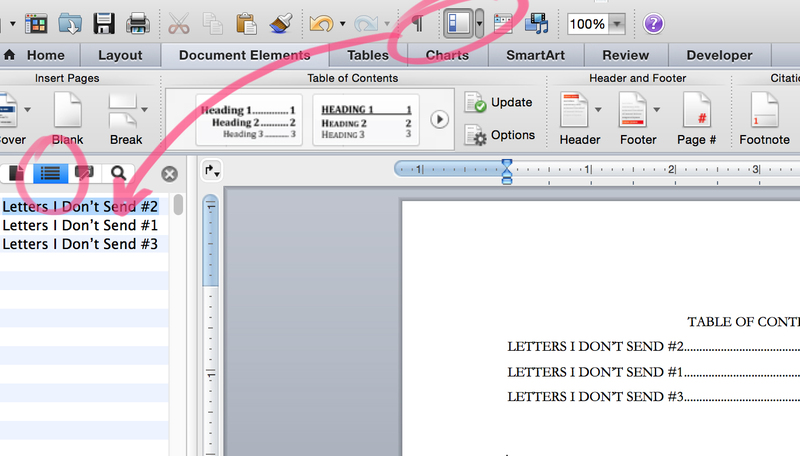 The page breaks are a kind of formatting mark and show up like other paragraph marks in different views of Word, so you can switch to “outline” or others in order to see them better. If you don’t include the page breaks with your cutting and pasting it’s just a little bit more housekeeping, so no worries. 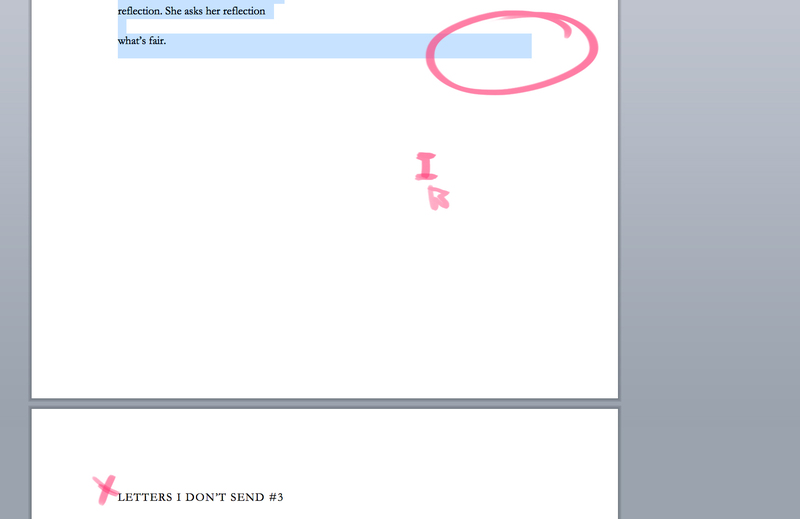 These are just my tips for moving things around cleanly in a large document. And if when you select a new text style you notice more text than just your header changing, that’s because you’ve used soft returns (shift+enter) between the title and the poem and there needs to be a full return in there somewhere. Or something. Play with it. 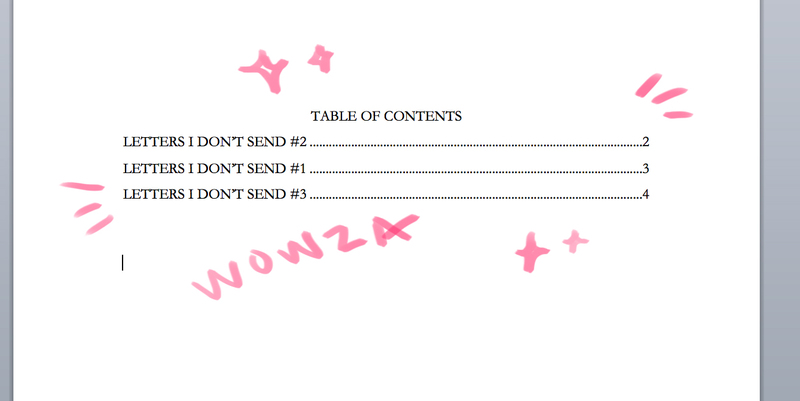 Hooray Table of Contents. And from here you can select any of the elements of the table (or just click to put the cursor there) and select from the Styles pane the various parts of the TOC you’d like to tweak. TOC Title, TOC 1, 2, 3, etc. There’s also an options pane in the Table of Contents dropdown area where you can mess with the leader (the dots or marks between the title and page number), etc. So now we’re selecting this poem in order to move it in between other poems and prove that our Table of Contents will auto-update at will. Remember to grab the page break! Ooh, let’s put it here, shall we? Insert another page break directly from the last line, and you’ll be able to snuggle the copy-paste between two page breaks like a boss. So you’ve changed up your poems or chapters, and now you want your TOC to catch up too. Click to make it active and then find the drop down menu from the tab on the top and update. You can update everything–or, just the page numbers, if you’ve added front-pages and all the page numbers have shifted and you don’t want it to change any of the titles (this is useful if you add extra notes to the TOC, like asterisks at the front of the title indicating it as an excerpt, etc). You can click and view the outline sidebar in order to navigate quickly through the whole thing, like in a PDF with chapters. Works regardless of inserting an actual Table of Contents. 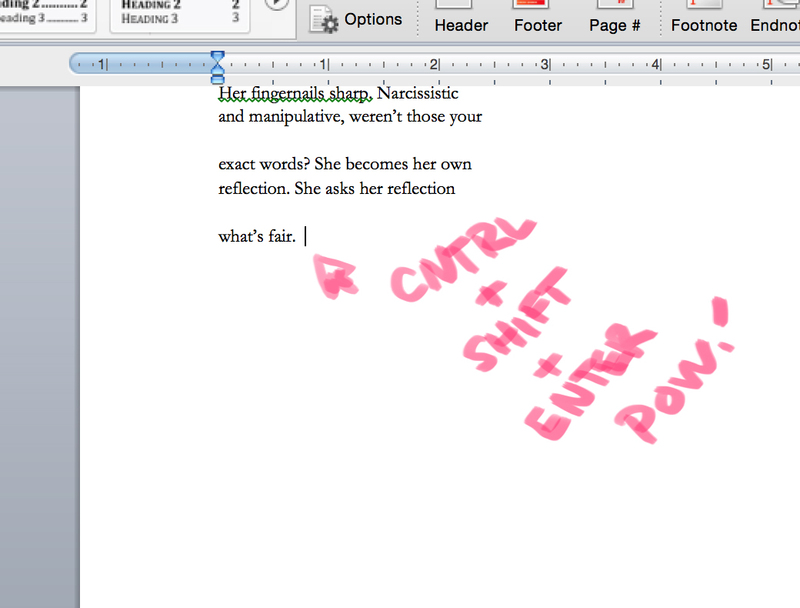 Use different levels of headers along with different styles to manipulate the manuscript to your liking. For one example, when I wanted the sections not to have distinguishable numbers in the TOC, I made the corresponding TOC style white so it would not show up in the contents page. 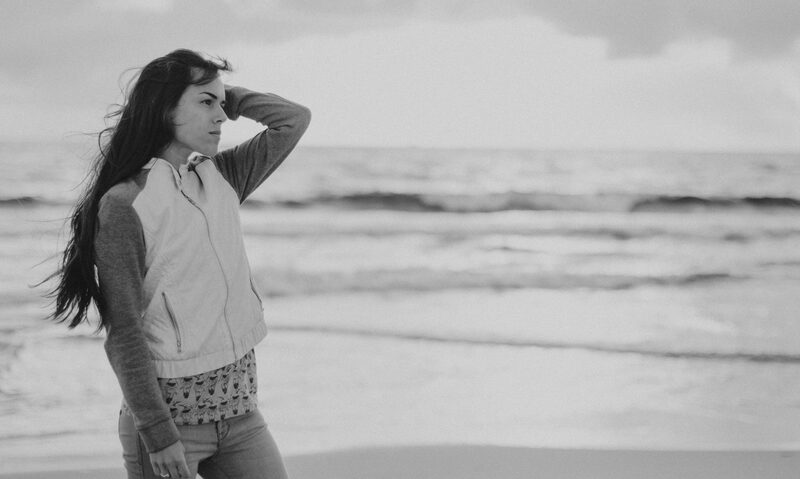 There are also further codes and tricks to styling as desired. 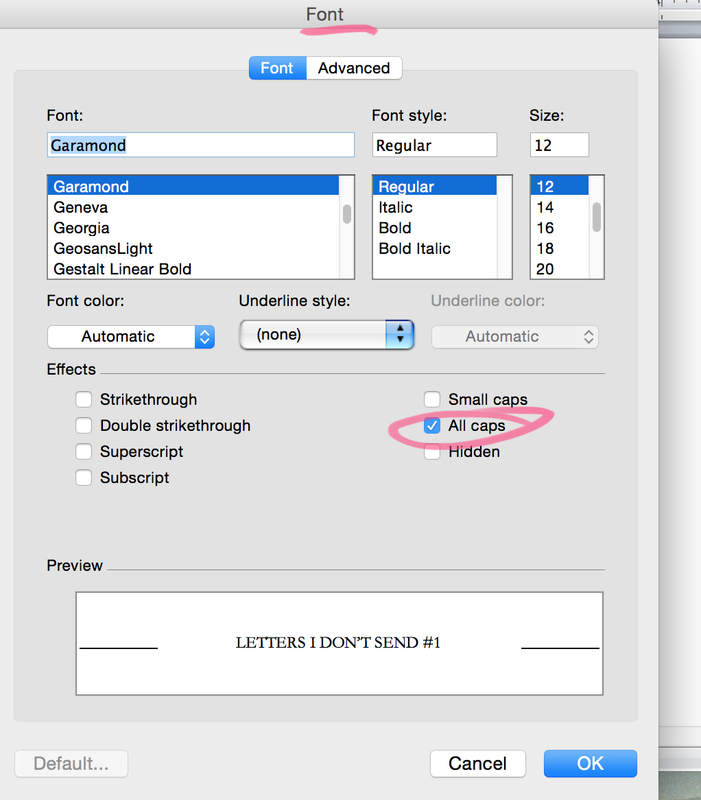 I hope this has been helpful, and that through using the Styles you’ll feel like you gained a little more visual control over Word. 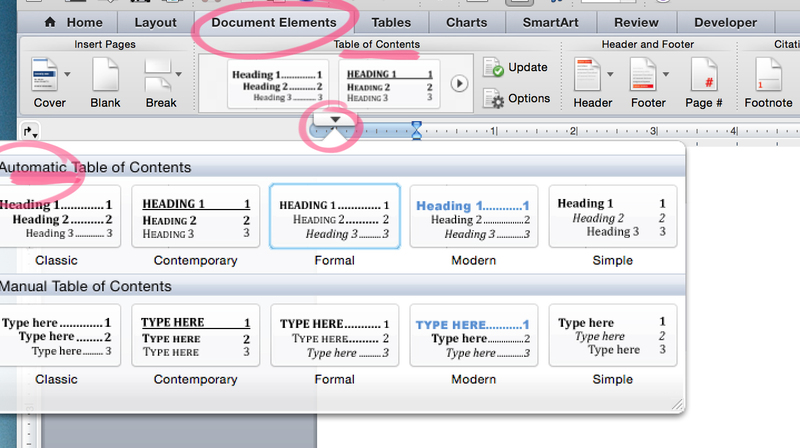 And even if you don’t use a Table of Contents in your document, the headers are so useful for navigating! Let me know what you think, share your own methods, or other tips and feedback, in the comments!